Sarah Sokol presents her research on phages. Together with Minnu Suresh they finished the project as a part of their honors capstone. 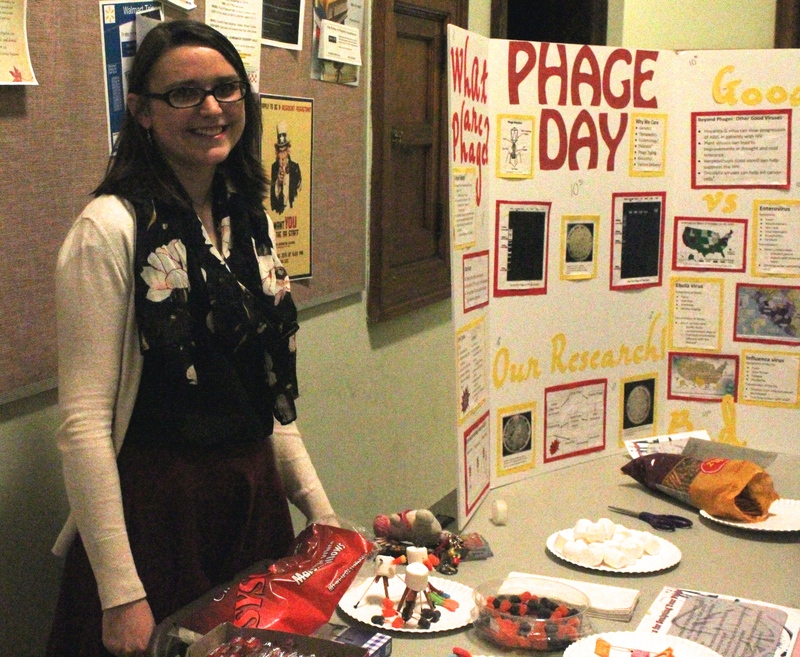 On October 31, Minnu Suresh and Sarah Sokol hosted Phage Day, an educational event celebrating healthy viruses. The event took place outside of Lowe cafeteria from 12:30 p.m. to 3:00 p.m. and was open to all members of Seton Hill University. Sokol and Suresh had teamed up to create Phage Day as part of their Honors Capstone project. Their aim was to educate students, faculty, and staff alike on the purpose and benefits of bacteriophages. “Not all viruses are bad!” said Sokol, a senior biology major. As listeners looked on, she explained that viruses known as bacteriophages target and kill harmful bacteria. These viruses are a normal and vital part of the human biological makeup. Suresh, a senior chemistry major, added that due to their effectiveness against bacteria, these helpful viruses are widely used in the medical field in combating harmful bacteria. “They’re very important for treatments and prevention,” she said. She noted that not many people are aware of these benefits, due to the common misconception that viruses as a whole are harmful to human health. The pair had set up a display board with information on the function and anatomy of bacteriophages. Marshmallows, gummy worms, and caramel candies were available for passersby to create their own edible bacteriophage models. Participants showed off their creations and posed for pictures with Suresh and Sokol. The pictures were then uploaded to a flat screen TV displaying a slide show of the creations. Sokol and Suresh have said that they are potentially planning a second event to continue raising greater awareness of bacteriophages.